I tipped my hand somewhat in my last post, A Walk Too Far, in mentioning that we have been using Fitbits® since Christmas. I’ve been meaning to write about them, so I’d better get to it. Basically, Fitbits® represent the next generation of pedometer, worn as a bracelet. It uses the same motion sensing technology used in the Wii system to track and interpret movement. It also tracks sleep patterns, which we found most interesting—we’d been curious to see just how often our cat, Spice, disturbs our sleep (the results are rather appalling). Goals may be set in calorie consumption, “active minutes,” distance covered, and steps taken. We have the Fitbit Flex®, which displays progress toward the steps goal with lights in 20% increments. There’s a grand irony to trying to monitor our lifestyle with this device. It is not a particularly off-the-grid friendly system. 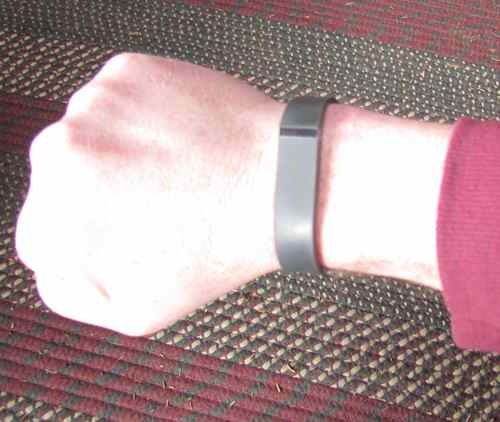 Mark’s Fitbit Flex (Photo: Mark A. Zeiger). For one thing, to read the reports, one must go online! I don’t understand why it didn’t come with software that would allow us to pull the information off the tracker with a computer alone. I suspect someone skims the data, and may make use of it somehow, someday. The tracking is limited in its scope. Users must augment it by going on line and entering additional information, such as listing particular activities, and the estimated calories burned in their pursuit (which requires some Googling). I tried this once; something failed, and not only did it not record the elevated calorie burn, it negated the default, baseline calorie burn. I lost credit, rather than gaining! In general, I’m not interested in inputing so much data. If I were, I’d merely track my activities on a spreadsheet, and be done with it. This quite often becomes comical. We often hike out to the road and back, hauling heavy packs both ways. We don’t move very fast under heavy loads, especially if we have to break trail on snowshoes, so when we’re finished, according to the Fitbit®, the chore often doesn’t qualify as “very active”! Never mind that we’re sweating freely, our hearts are pounding, and our joints are sore. If I want to log some active minutes by the device’s lights, though, all I need do is scratch Michelle’s back using the hand on which I wear the bracelet! What I find funniest is how easy it is to let the thing modify our behavior. We anticipate reaching the day’s goals, then begin to wonder if we’ll go far enough beyond them to hit further milestones. These are the “badges” I mentioned in the previous post. It’s easy to live by the arbitrary parameters set by the device, and forget that simply by doing the work of the “homestead” each day, we’re getting a far more intense work out than most people. These things are ideally suited for urban/suburban dwellers trying to monitor themselves to ensure that they’re staying active each day. For us, they’re an interesting monitor of activity levels, somewhat analogous to a rain gauge. It’s interesting to see exactly how much we’re actually experiencing as opposed to the perception, but having the exact data isn’t really necessary or life changing.